How did this app come to my attention? – I was looking for news apps which would provide me with an easy-to-use and customisable news feed. In my search, I came across an article on The Next Web which was titled 10 must-have iPhone apps for keeping on top of the news, which mentioned Circa as one of its ten apps to check out. My quick summary of the app (before using it) – Circa provides a constant news stream which I can filter based on my specific interests. I expect Circa to send push notifications with relevant news updates. Getting started, what’s the sign-up process like? – I like that the Circa app gives me the option to “sign up later” as I prefer to sign up for accounts at a later stage. This gives me a chance to familiarise myself with the app first. 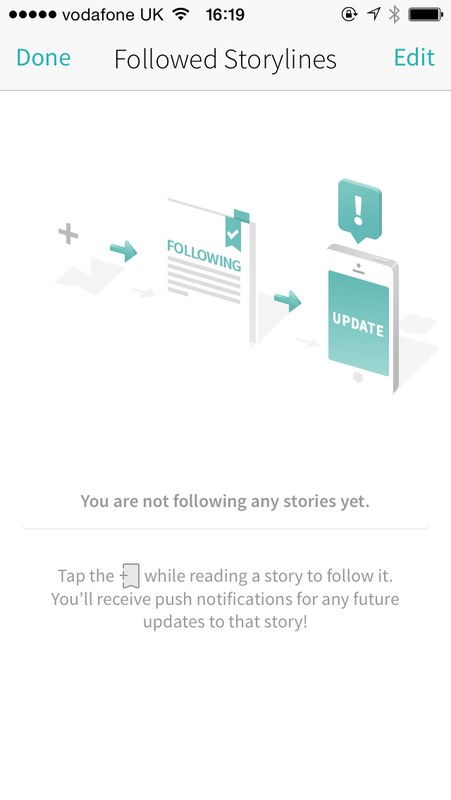 The popup explaining notifications is also easy to understand; explaining both the procedure (“tap OK when prompted”) and the benefits (“You’ll receive breaking news, followed story updates, etc.”) (see Fig. 1 below). How does the app explain itself in the first minute? – When I click on the bookmark icon on an article in the “Arts & Entertainment” section, the app explains that I can follow story lines, getting push notifications as a story develops (see Fig. 2 below). The one thing that didn’t become immediately clear from the this tooltip was whether I need to be signed into Circa to be able to follow or to share a story. When I do go into a top story, it’s apparent – through the top navigation in the app – what I need to do if I wish to follow or to share a news story respectively. Once I’ve clicked the “follow” button, the button’s state changes immediately to “following” (see Fig. 3 below). How easy to use was the app? – Very straightforward. 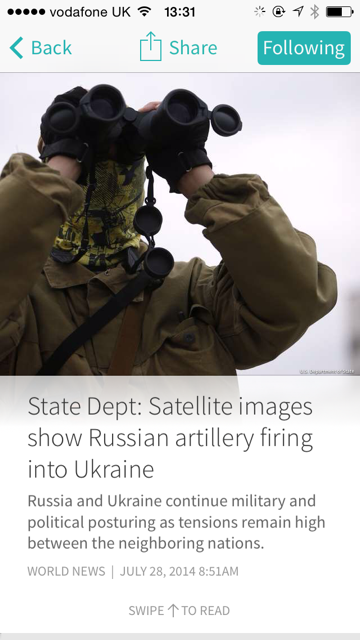 On iOS at least, the main actions are limited, simple and well presented: read, share and follow news stories. I liked how comments related to a story get highlighted – the background colour changes from grey to white – when you scroll down a story. This is a welcome feature given that there’s quite a lot of content on each article page. How did I feel while exploring the app? – Because of it’s simple navigation structure, I found the Circa app easy to navigate. The sections which feature different articles are self-explanatory and well sign-posted. However, I missed a profile or a “For You” section which contains all the stories that I follow across the different sections. It would be nice if I could see in my section which stories I follow across the ‘genres’ that I’m interested in (e.g. technology and sports) and perhaps get some personalised recommendations based on my interests. Not only will help me to understand where follow-up stories to my original ‘follows’ come from, it will also provide me with a nice ‘discovery path’. A personalised section can help me to find slightly older articles and their related stories to follows, which can be helpful particularly if I wish to share a slightly older article (and I can’t remember what it was). Did the app deliver on my expectations? – The Circa app definitely delivers on its main strap line: “Save Time. Stay Informed”. I find it easy to follow news stories and with Circa’s push notifications, I can dip in and out of stories as they developed. How long did I spend using the app? – So far, I’ve used the Circa app between 2-4 hours over the past month, reading and following stories. How does this app compare to similar apps? – There are a lot of news app out there and I see apps such as Flipboard, Daily Mail Online, Pocket, Zite, Facebook Paper and LinkedIn Pulse as direct competitors which offer a user proposition similar to Circa. Circa probably has the cleanest and most intuitive design out of all of them, closely followed by Flipboard. However, I feel that Flipboard gives me more reasons to keep coming back to the app; more opportunities for content discovery and better geared towards ‘collecting’ stories. 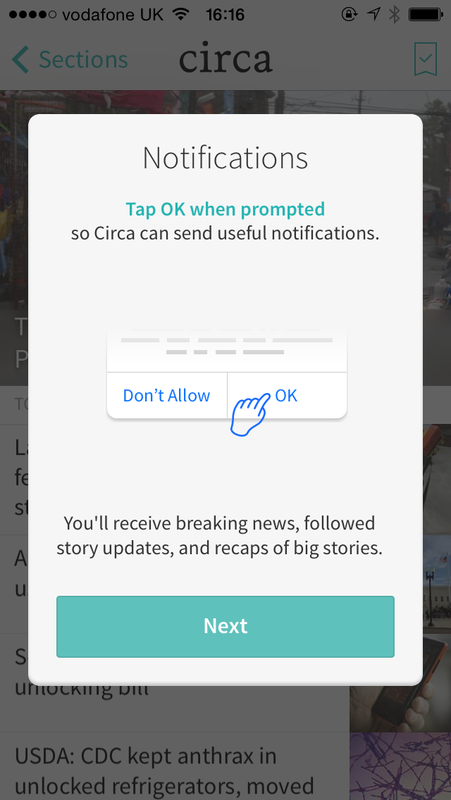 Main learning point: Circa is a simple, easy to use news app. It’s one of those “single purpose” apps which successfully delivers on its core proposition. However, I personally would like to see the app improve on its content discovery elements, encouraging users more to explore new content and to see which stories other people are following.